Who is psychic, John Edward? "John Edward MaGee, Jr., (born October 19, 1969 in Glen Cove, New York), better known as John Edward, is the creator and host of the television show Crossing Over with John Edward featured on the SciFi Channel , and on LIVINGtv  in the UK." "John appears on the show Crossing Over with John Edward in which he claims that he communicates with the deceased relatives or friends of those in the gallery, or studio audience - this is often called a "reading". This involves John Edward standing before the audience, and speaking with its members, relaying the information he supposedly garners from their deceased acquaintances. The audience members then either confirm or deny aspects of the subject Edward is discussing. The show often employs a split screen, so that the viewer can witness John Edward continuing his reading without sound on one half of the screen, whilst on the other half the audience member being read discusses the accuracy of John Edward's claims. A voiceover is also implemented to help aid the viewer, giving a greater overview of what is occurring, and providing details which may be relevant to the context of the reading. There are also instances where John Edward will conduct a private session away from the gallery, which is still filmed and commented upon. This is often the more "in-depth" part of the show, where those read, along with their families, talk in greater detail about the situation that lead up to their reading with Edward, and what conclusions they have drawn from the event. Periodically, Crossing Over will feature a part of the show that attempts to "catch-up" with those who have previously been read by John Edward." The Word of God Condemns Psychic Mediums! The Word of God condemns witchcraft, psychics, fortunetellers, soothsayers, Tarots, astrologers, horoscopes, palm reading, Astral projection, Wicca, magicians, sorcerers, wizards, spiritualists, necromancers, yoga, and every other form of demonism that taps into Satan's power. The only acceptable power is the Holy Spirit of God (Zechariah 4:6), and the Word of God (Hebrews 4:2). King Saul Died for Consulting a Familiar Spirit! If God was angry enough at king Saul to allow him to die at the hand of the Philistines, do you think God is indifferent towards those people today who seek counsel from mediums like John Edward? No way! Malachi 3:6 proclaims that God NEVER changes! The same God who hated occult practices in the Old Testament, still hates them today. Please note, God doesn't hate people, He hates sin. Some people have a hard time understanding how God can hate someone's sins, and yet love the individual person; but, God certainly does love all sinners. Jesus didn't just die for the righteous, He died for all humanity (John 3:16; 1st John 2:2; 2nd Peter 2:1). All psychics are serving the Devil, whether knowingly or ignorantly. It's tragic that so many people, who are seeking the truth, are being victimized by these devilish imposters who claim to have connections with THE OTHER SIDE. Listen friend, there is nothing in the Word of God concerning such connections between the dead and the living. Sure, we'd all like to believe that it's possible; but, it is simply not taught in the Word of God. Either you're going to trust God's Word, or you're going to follow men (Psalm 118:8). The Scriptures plainly teach that when a person dies, their soul IMMEDIATELY goes, either to Heaven to be with the Lord, or into Hell to be tormented (2nd Corinthians 5:8; Luke 16:22,23). It is abundantly clear from Luke 16, that the rich man who perished into Hell was forbidden from returning to warn his living brothers. Thus, he begged Abraham to send someone else (Luke 16:27,28); but, was refused. I'm amazed at just how ignorant people are. I mean, the Bible is historically, archeologically, scientifically, and chronologically accurate; yet, people won't fully believe it. BUT, they'll believe some psychic medium on TV just because he claims to have a power. One of the reasons why I believe the Bible is God's Word is because it is so logical, documented, and factual. If you want to find the truth about anything, you must begin with the FACTS. So many religions today are based upon the writings of heretics, such as Christian Science (based on the heresies of Mary Baker Eddy). The thing that makes it so easy to expose these false religions is that they ALL twist the Bible to support their lies (Romans 1:25). It's the very Bible they claim to believe that condemns them. For example: Mary Baker Eddy claims that she was the fulfillment of Christ's promise to send the "Comforter." What blasphemy!!! Since Mrs. Eddy is twisting and misinterpreting the Word of God, it is easy to expose her. Biblical truths are facts! It's a Biblical FACT that the Holy Spirit, which Jesus promised, came on the Day of Pentecost in Acts 2; not, in the 20th century in the form of Mrs. Eddy. Satan is a trickster, a deceiver (2nd Corinthians 4:4, 11:14). Don't be deceived friend, John Edward's psychic powers are of the devil. Spiritualists and Fortunetellers are "An Abomination Unto the Lord." 'In the Old Testament, many, many passages of God's Word condemn the wicked practices of spiritualists, fortunetellers, Hindu mystics, etc. The term "familiar spirit" refers especially, throughout the Bible, to those who claim to be on familiar terms with the unseen spirits." The Great Deception of Psychic Medium John Edward! "John Edward’s focus in spiritual teaching is now being spotlighted on his own path of religious and spiritual enlightenment, and he is now sharing it in this book, PRACTICAL PRAYING: Using the Rosary to Enhance your Life." Mr. Edward is extremely dangerous, a necromancer who sinfully attempts to communicate with the dead; yet, he has written books on how to pray and be spiritually enlightened. Clearly, he is putting himself forth as a Christian. People who are ignorant of the Word of God are easily conned by such false prophets. Although he is commonly known as the man who talks to the dead, he also talks to Mary and has been devoted to her since as a teenager he was drawn to accounts of a woman in Queens, N.Y., who said she was receiving messages from Mary and seeing apparitions. He joined the crowds that gathered in her neighborhood to share in the experience. 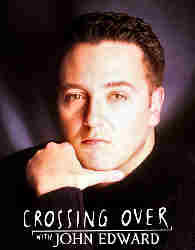 Clearly, John Edward is somewhat a Catholic, but not a Christian. Catholicism is of the Devil, requiring works salvation of it's followers. Mary is elevated as a god. It doesn't surprise me that John Edward would say nice things about the Rosary, as I'm sure millions of Catholics will buy his materials. Satan is loving every bit of the messed up religious world today. You've got false religions and occultists working together to DECEIVE the masses. False prophet, Benny Hinn, presents the Gospel on his website, while also endorsing Catholicism's Our Lady of Fatima (Mary) on the Larry King Live show. Hinn is also a Charismatic, deceiving the masses with his fake healings. His organization took in over $100,000,000 last year alone. Hinn is leading the masses into apostasy. And the irony of it all is that he starts with the Gospel. Listen folks, most false religions in America believe the Gospel (i.e., the death, burial, and resurrection of Jesus Christ). BUT, then they corrupt that Gospel message, either by teaching, or by practice. For example: The Catholic Church teaches that a person MUST keep the Seven Sacraments to go to Heaven. You see, they have corrupted the simple Gospel message! Only by faith alone in Jesus Christ can anyone be saved (Acts 4:12, 16:31). Satanic psychic medium, John Edward, endorses Catholicism's Rosary. The Rosary, or prayer beads, was introduced by Peter the Hermit, in the year 1090. It was copied from Hindus and Mohammedans. The counting of prayers is a pagan practice and is expressly condemned by Christ (Matthew 6:5-13). John Edward, like so many modernists today, is playing whatever cards necessary to make himself rich. This is what modernists do, they EXPLOIT the Word of God and Christianity for their own wealth, popularity, influence, and personal gain; BUT, they are not true Christians. Whenever you hear someone talking about God and prayer; BUT, they never quote the Word of God, something is very wrong. John 4:24 declares that God can ONLY be worshipped in Truth, and God's Word is Truth (John 17:17). There's many false prophets today teaching New Age, who speak of energy and power; BUT, it's not of God! John Edward is a false teacher of New Age philosophies and lies. The power he speaks of is a familiar spirit; NOT, the Holy Spirit! "At the end of John Edward's show, the following legal disclaimer appears for approximately three seconds: The producer has relied heavily on the contributions of John Edward and other third parties in the creation of this program, which has been produced for entertainment purposes only. Materials and opinions presented in this program by John Edward and other third parties, including statements, predictions, documents, photos, and video footage come solely from the respective third party sources and are not the views, opinions, and the responsibility of the producer and, are not meant or intended to be a form of advice, instruction, suggestion, counsel or factual statement in any way whatsoever.